Plastige interlocking floor tiles are remarkably easy to install and this makes them ideal for the D.I.Y. enthusiast. 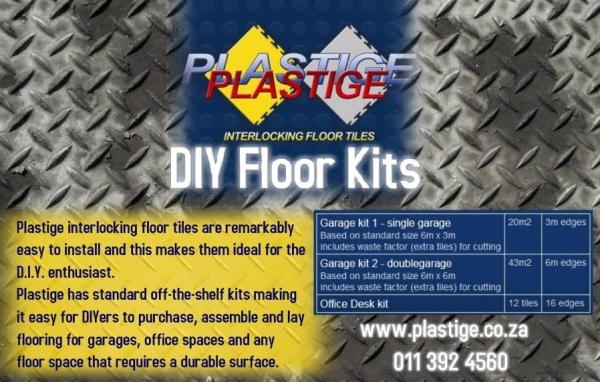 Plastige has standard off-the-shelf kits making it easy for DIYers to purchase, assemble and lay flooring for garages, office spaces and any floor space that requires a durable surface. A rubber mallet and a sharp knife are the only tools needed to lay the tiles in the desired configuration.The versatility of our interlocking floor tiles are so that when laying the tiles, contact adhesive is not necessary, so that the flooring can be rearranged if need be. As a final detail, tapered edges are available to accommodate easy access for vehicles, wheelchairs and trolleys. 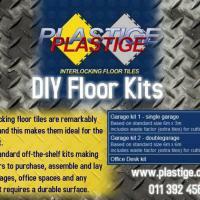 We also will arrange that your floor kits are delivered to your door almost everywhere in South Africa. Contact us to make inquiry, for quotation or to discuss any special requirements. Easy to install and versatile interlocking raised medallion tile provides an ideal floor surface for sporting facilities, like gyms, that require safety, durability and low maintenance finishes.